Who is paying for this program? Ferris Coin Co., one of the nation’s oldest rare coin shops, located at 199 Wolf Road, Albany, NY 12205. What is Ferris Coin Co? Trusted since 1930, Ferris Coin buys and sells gold and silver bullion, rare coins, flatware and paper currency, as well as gold and platinum jewelry for resale, repair or recycle. Husband and wife Charlie & Arlene Ferris opened Ferris Stamp in downtown Albany, N.Y. at 402 Broadway. In Wendell C. Williams purchased the business in the 1960s, relocating the shop to Lark Street before moving again to 114 Central Ave. in 1976. Why is ferris coin hosting this competition? First, because we are passionate about coins and medals. We are also passionate about community and history. It is our hope that this coin-shaped medallion honoring Sgt. Henry Johnson will help raise further awareness for the story of this American hero. This contest is also a way for Ferris Coin to contribute to the annual Henry Johnson Award for Distinguished Community Service; for the next 10 years, we will donate a silver Sgt. Henry Johnson medallion to the winner of this community award. I CAN'T SCULPT. HOW COULD I DESIGN A COIN? You need only submit a two-dimensional black and white line art drawing of your coin design. A master engraver will oversee the "coin-ification" of your art. 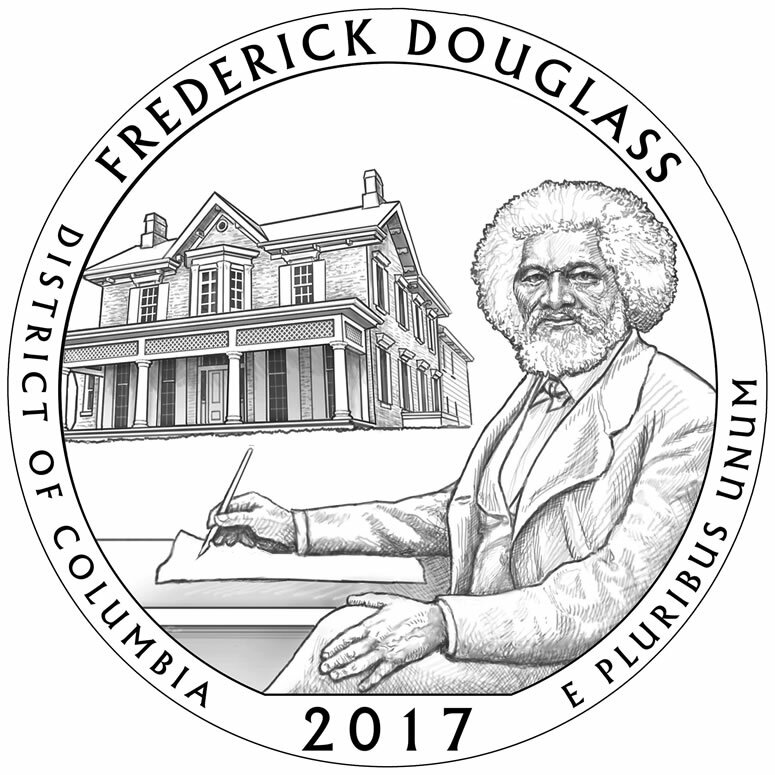 Here is an example of a coin design for the U.S. Mint's 2017 Frederick Douglass quarter. (Click here to view more coin designs). I am a medal sculptor. Can I submit a sculpted design? Yes. You may sculpt your design. However, please do not mail in the original. Take photographs of your sculpt and send those. If you have a 2D line art sketch as well, please send that in. Who will be judging the competition? Entries will be evaluated by an expert jury composed of esteemed professional artists and a representative of the 369th Veteran’s Association. No identifying information will be included in the submission materials presented to the jury. Why are you calling this a coin-shaped medallion? Although these medallions will be coin shaped and made from valuable metal, they will not have any currency denomination and cannot be used as legal tender. We also use the term “coin-shaped medallion” to make clear that this contest is not part of the the U.S. Mint’s commemorative coin program. Though not preferred, physical paper facsimile submissions will be accepted at Ferris Coin by mail or by hand delivery up until 5 p.m. on the last day of the competition. Each of the 2 winning designs will receive $1,000. Though it is possible for one artist to win the design for both sides of the medallion, it is likely the medallion will feature designs by two different artists. The winner(s) will be recognized in historical documents, publicity, and on a Certificate of Authenticity. How much will the coins cost? Because the value of silver fluctuates, the exact cost of the coin-shaped medallion will change with the market value. However, Ferris Coin Co. will price the medallions as low as possible in order to make these within reach of as many people as possible. A portion of the sales will benefit the 369th Veteran’s Association, a 501(c)3 nonprofit organization that supports the annual Henry Johnson Award for Distinguished Community Service. Are you Profiting off of a hero? Though Ferris Coin Co. is a business, and our business specializes in selling coins, we do not anticipate to profit from sales of this coin-shaped medallion but we do aim to recoup a portion of our expenses from the prize money, creation of the die casts, advertising and other promotional costs. We do hope that this effort will introduce our company to a new and larger audience, and we recognize that is just one of many benefits we gain from this endeavor. The helmet on the Henry Johnson statue bust does not look like a "doughboy" helmet. What kind of helmet is that? Sgt. Johnson's regiment — the 369th Infantry Regiment, formerly known as the 15th New York National Guard Regiment (also known as the “Harlem Hellfighters”) — wore the French Adrian helmet, not the Brodie helmet (or doughboy helmet). DO I HAVE TO SUBMIT DESIGNS FOR BOTH SIDES OF THE MEDALLION? No. You can submit designs for one or both sides. CAN I SUBMIT MORE THAN ONE DESIGN? You may submit more than one design for one or both sides.